Enjoy a fun-filled evening for adults as we experience by-gone days in the Historic Cahill School, listed on the National Register of Historic Places and one of Edina’s oldest buildings. Explore 19th century education during the age of wooden desks, kerosene lanterns and coal-burning stoves in this authentic one-room schoolhouse. You’ll be greeted by 19th century school master, Mr. Thomas, sharing tales of Minnesota’s one-room schoolhouses, followed by refreshments across the courtyard at the Historic 1879 Minnehaha Grange Hall. Enjoy a special night of movies, popcorn and history at the Edina History Museum! On June 15th, 1966, over 1700 automobiles arrived to view the inaugural film at Mann's France Avenue Drive-In Theater. Advertised as the “world’s most distinctive and beautiful drive-in theater” with the “world’s biggest screen,” the France Avenue Drive-In was one of more than 4000 drive-in theaters built during the 1950s and 1960s. Join filmmaker and historian Alex Weston for an exploration of the Drive-In in American culture, featuring local history, movie clips, vintage trailers and rare photographs from the golden age of movies under the stars. Starting with its first brewery in 1849, Doug Hoverson tells the story of Minnesota’s beer industry from the small-town breweries that gave way to larger companies with regional and national prominence to the vibrant beer culture of today. Speaker and author, Doug Hoverson is the associate editor of the American Breweriana Journal, an award-winning homebrewer, and a certified beer judge. He teaches social studies and coaches the debate team at St. Thomas Academy in Mendota Heights, Minnesota. Coincidentally, Sean Ewen, Wooden Hill’s Chief Beerpreneur, was one of Doug’s former STA students and debate team members. Doug’s book, Land of Amber Waters will be available for purchase and it marvelously chronicles Minnesota’s rich brewing traditions. NOTE: This event will be held at Wooden Hill Brewery. Food and beverages will be available for purchase. It has been 50 years since Neil Armstrong stepped foot on the lunar surface, making "one small step for man, one giant leap for mankind." On July 20, 1969, hundreds of millions across the world watched as Apollo 11 made its historic landing. That day will long be remembered as the first-time mankind ventured beyond the earth’s boundaries to explore a new world. But why did we go to the moon? What was it about that moment in history that would lead the nation to embrace a quest that many deemed impossible? Join us for a non-technical discussion of the many forces at work -- political, social and fiscal -- that led to mankind’s greatest technological achievement. If you’ve ever sailed, boated or paddled past a vintage boathouse on Lake Minnetonka and wished its rustic wooden walls could talk, you’ll enjoy this fascinating conversation with author Melinda Nelson and photographer Karen Melvin. Melinda and Karen will share stories and photos of vintage and new boathouses around Lake Minnetonka and sign copies of their book. If you already own a copy, bring it and the authors will happily sign it! Creaking floors. Door ajar. Lights flickering. Hairs on end. Tis the season for all things creepy. What better way to celebrate the other-worldly than spending an evening with some ghost hunters? The acclaimed Johnsdale Paranormal Group will be treating us to an evening of highlights from their favorite Minnesota Hauntings. Come ready for some chills and thrills. Nightmares guaranteed. Join us for an evening with the charming and engaging, Kieran Folliard. Kieran is the consummate entrepreneur with a keen eye for creating culinary experiences for Minnesotans with an Irish twist; Kieran’s Irish Pub, The Local, The Liffey and Cooper. And we can’t forget to mention the creator of the refreshing, 2 Gingers Irish Whiskey. Kieran will keep us entertained as he shares his journey from the Emerald Isle to the Land of 10,000 Lakes. Enjoy a special night of movies, popcorn and history at the Edina History Museum! From the first silent flickers of motion captured in the 1890s until today, cinema screens have been bringing hideous, terrifying and altogether monstrous creatures to life. From the gothic monsters of the 1930s to the atomic mutants of the 1950s and beyond, movie monsters tap into timeless fears, while also revealing a great deal about the time and culture in which they were created. Join filmmaker and historian Alex Weston for a night of film clips exploring the cultural history behind some of the most famous monsters of filmland. It will thrill you. It may shock you. It might even — horrify you. Note: This program will show some clips from movies that were rated “PG-13 ““R” by the MPAA. The Yancey family was one of Edina’s founding families, leaders not only in the local community, but across the State of Minnesota as well. Discover the amazing history of this pioneering family, from their early years in slavery to becoming successful frontier farmers and important leaders in the growth of Edina. The story of the Yanceys isn’t just the story of one historic family; it is the story of Edina’s roots and its successful transition from a rural community to a prosperous suburb. This popular program SOLD OUT the last two years, so we are bringing it back for a third holiday season! 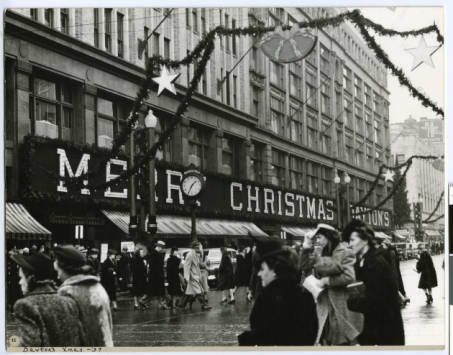 For 100 years Dayton’s department store helped Minnesotans celebrate Christmas. We will look at how Dayton’s made the Christmas season magical by reviewing various window displays, unique gifts, store promotions, Santa Land, the unforgettable auditorium displays, along with a general history of the Minneapolis retail store. We will also look at the behind the scenes action by examining anecdotes from the management and the ever-helpful store employees, who made the name Dayton’s synonymous with Christmas shopping.